I wrote this poem. It is called "Get out of the Chair" by David DuVal Sitting in chair. Sitting in chair. World out there. Facebook can your find it? People Can you Hear Me? Here is a nice recipe for Chana Masala that is pretty easy to follow and came out good for me. So first I was frustrated that maybe Google was making it hard to login to Adsense on Firefox, hoping maybe I would use the Chrome browser instead. I was using Firefox because Chrome had crashed so hard the other day that it removed all the extensions and reinstalled itself. 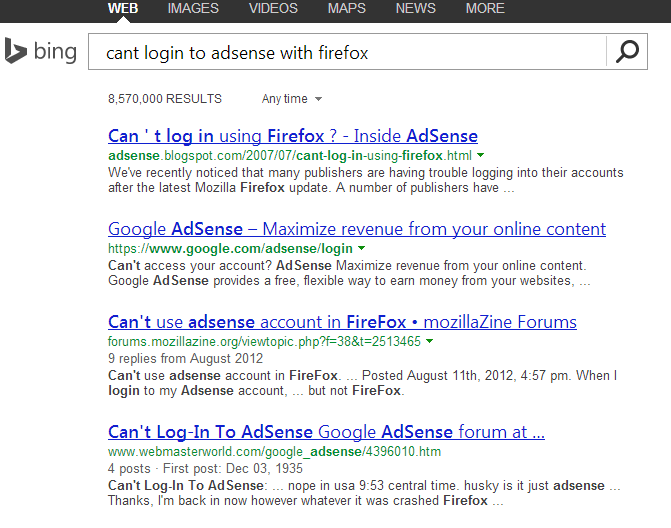 So then I searched Bing to see if anyone else was having trouble with logging into Adsense on Firefox, and the 4th result surprised me. Seems the problem pre-dates the internet! This is just a placeholder for some URLs that are more in state of stasis, or I don't know exactly what to do next! Shirpas - I got this domain for Sherpas, the people who help you get up mountains like Everest, but unfortunately I have the spelling wrong. I did add some content reflective of this dilemna. Phone Treasure - started out as a testing domain for a cell phone buyback app we were developing as a customer. Now what? Ginger Rogers - Kind of a cool site with a collection of old movies featuring Ginger Rogers. World of Facts - This actually used to be a pretty cool site and then some old php scripts were hijacked and had to take it offline. I've started over but haven't put the time in to make it like it was before. Baseball Plexus - Had an old demo app installed there but turned it more into a content site with vidoes, links and a couple of articles. Baseball Notes - Getting pretty cool. This is a site that has baseball quotes from famous people. So far there are maybe 4 people and 30 quotes added, so more can me done. Website Portal - One of the oldest domains I own and for which I have done little!. It's kind of a cool domain name and would be great to do something with it. Get it in your mind... your behind will follow your mind.